Max Larocque Construction inc. realizing your dreams since 1990. A small but complex room to renovate. 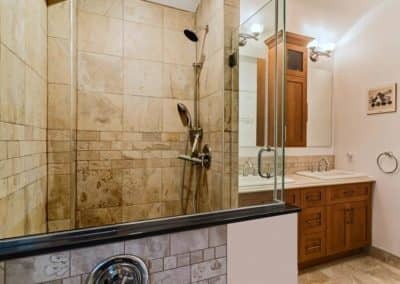 How to optimize a bathroom renovation? 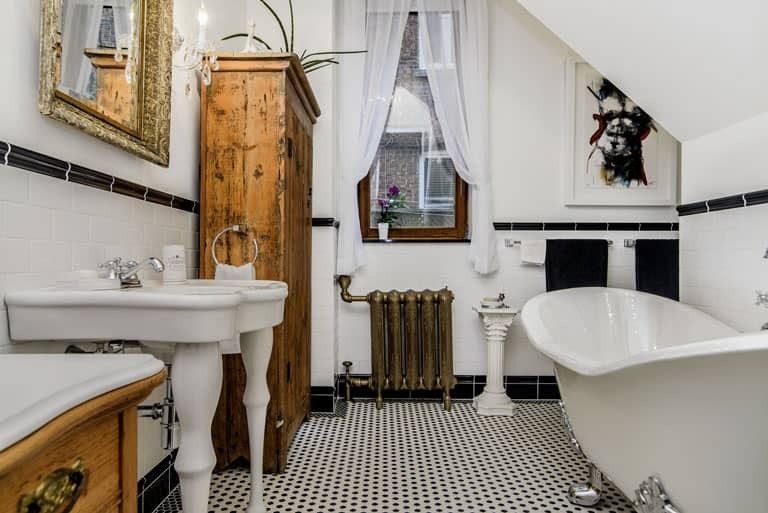 The bathroom is often the smallest room in the house. Yet it is the most difficult to renovate for many reasons. 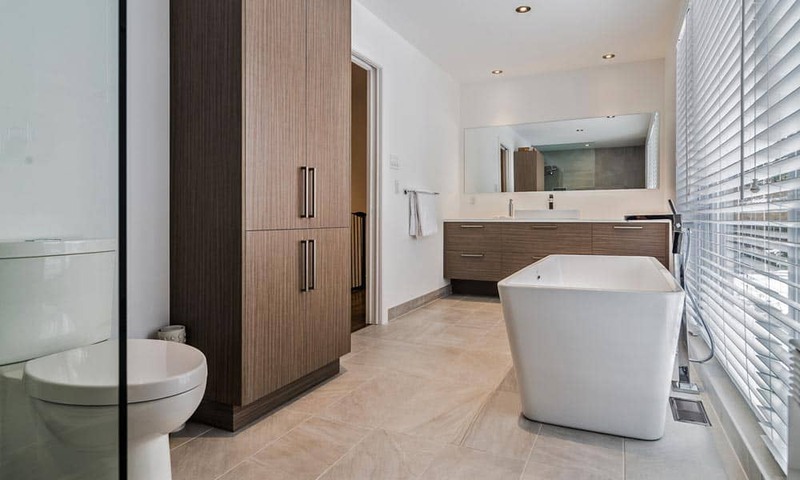 Whether it’s adding a shower, expending a bathroom, or incorporating a corner bath, any bathroom renovation requires solid expertise. 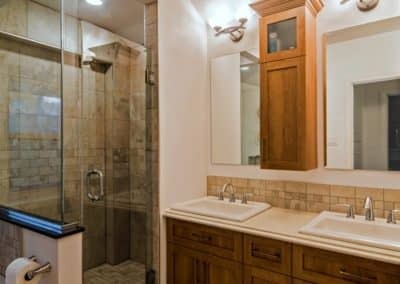 Ten more square feet in a bathroom can make the difference between a barely functional room and a comfortable bathroom. Find inspiration for your kitchen by exploring some of the projects we have realized! Today with the ever growing number of magazines and specialized programs, the expectations of consumers are increasingly large and varied. 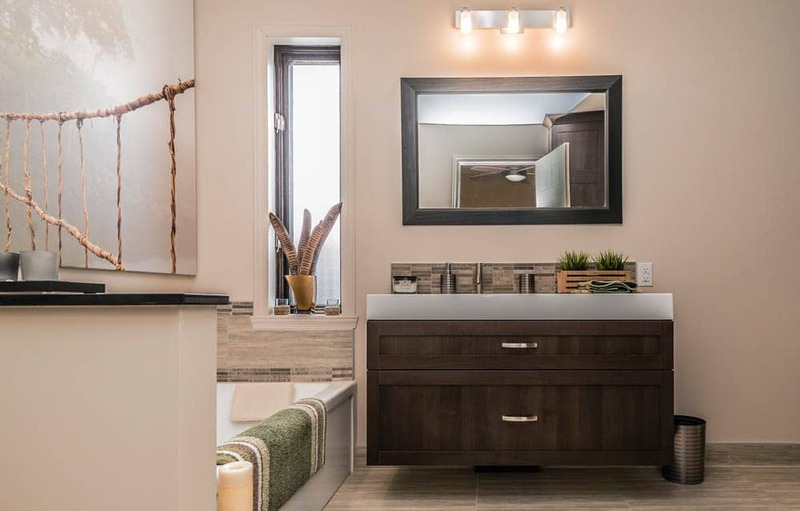 Whether it’s adding a shower, expending a bathroom, or making it more functional, we offer original and personalized alternatives but, above all, well-adapted to the needs of our customers when comes the time to design a bathroom renovation project. 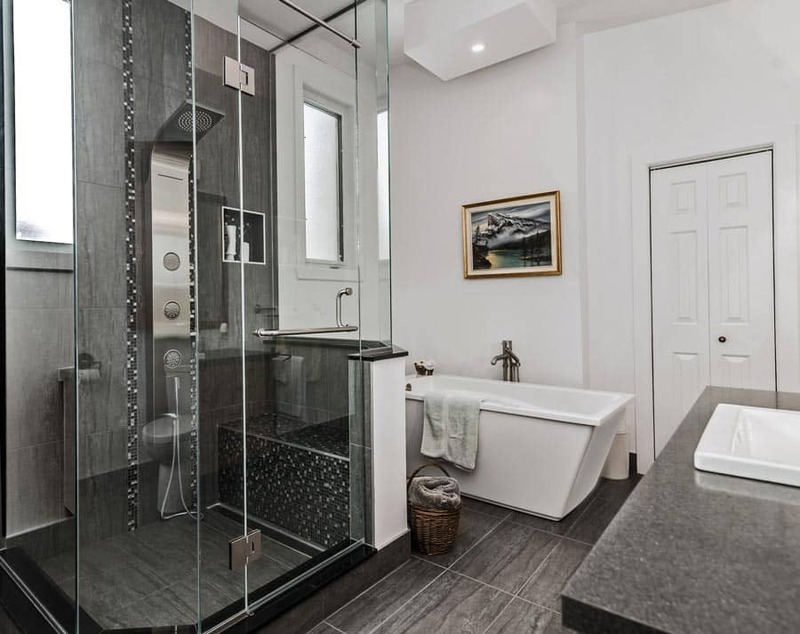 We realized this new bathroom as part of a conversion from a duplex to a cottage. 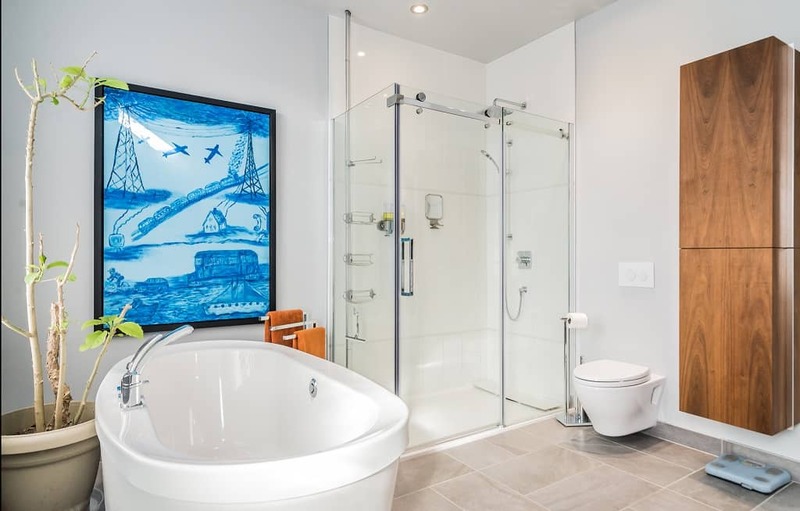 We used one of the upstairs bedrooms to create this bathroom. 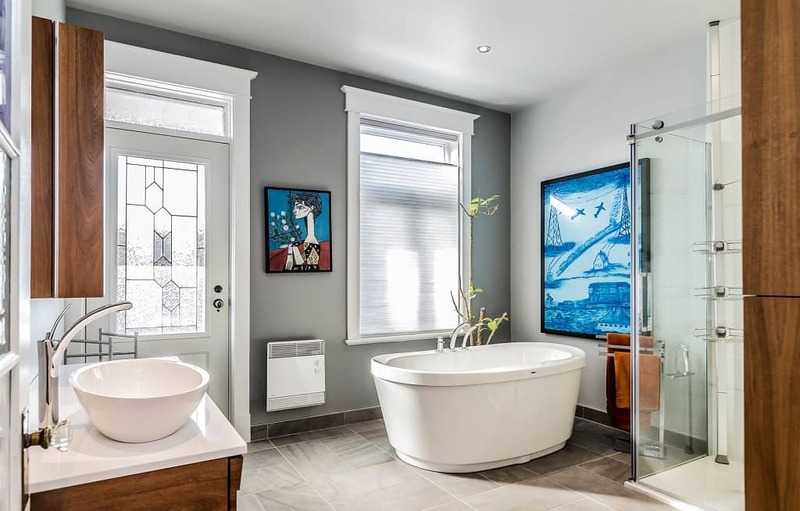 We suggested to the owners to preserve the keep the numerous windows in the room to highlight the bath-tub. 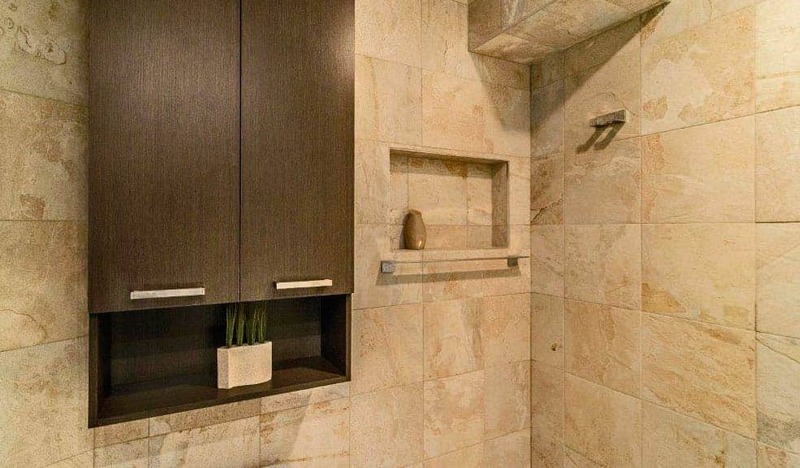 The shower and sink are more discreet while remaining functional and well integrated into the whole. Transformation from duplex to cottage requires good planning to estimate the costs. Our design-build team is ideal to advise you in this matter. 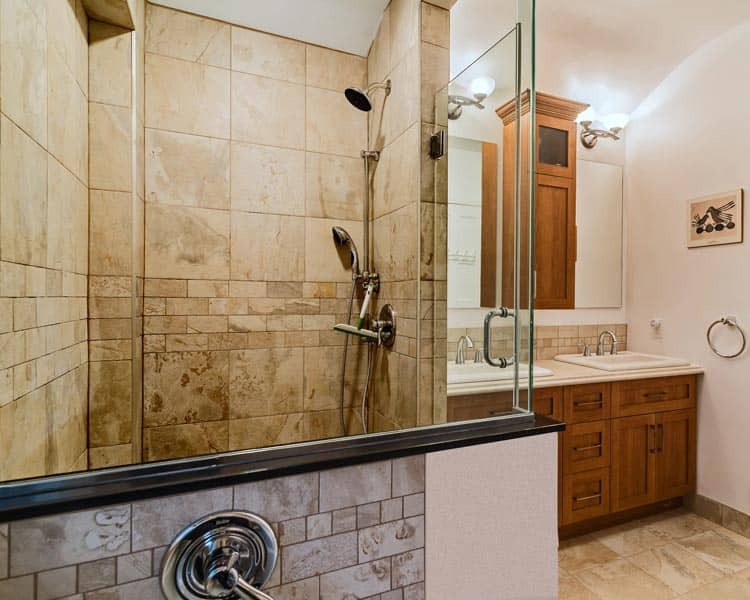 The acrylic shower and the podium bath are typical of the 1980’s bathrooms. The standard acrylic shower has the flaws of being relatively small and having a slippery floor. 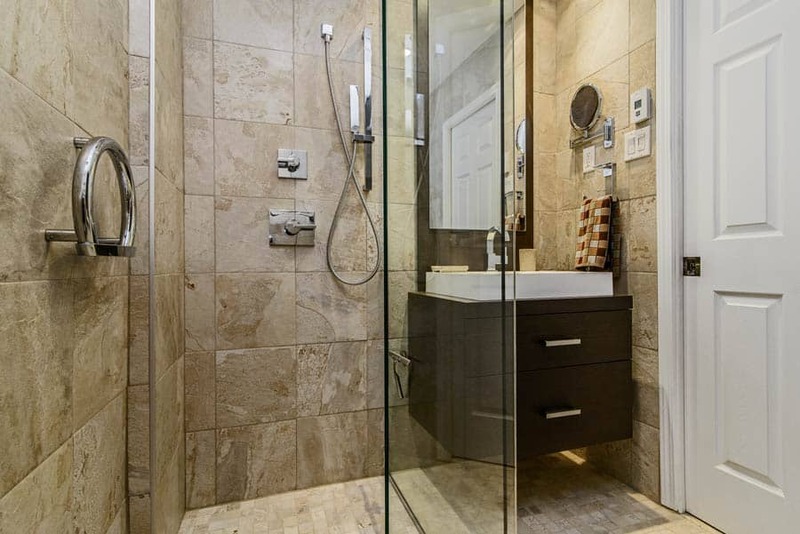 Our client wanted a larger and more stylish shower for his bathroom renovation project. 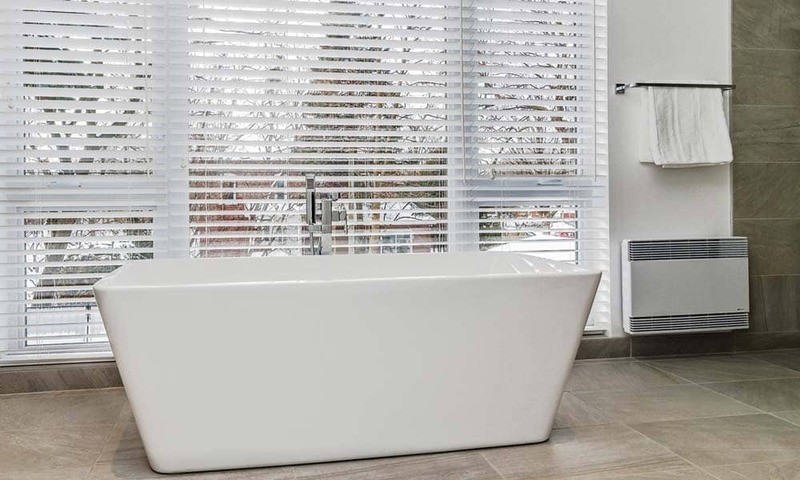 Unlike prefabricated acrylic showers, the ceramic shower with glass panels allows you to achieve the desired shape depending on the space available. Its ceramic floor is laid on a membrane that guarantees its waterproofness. 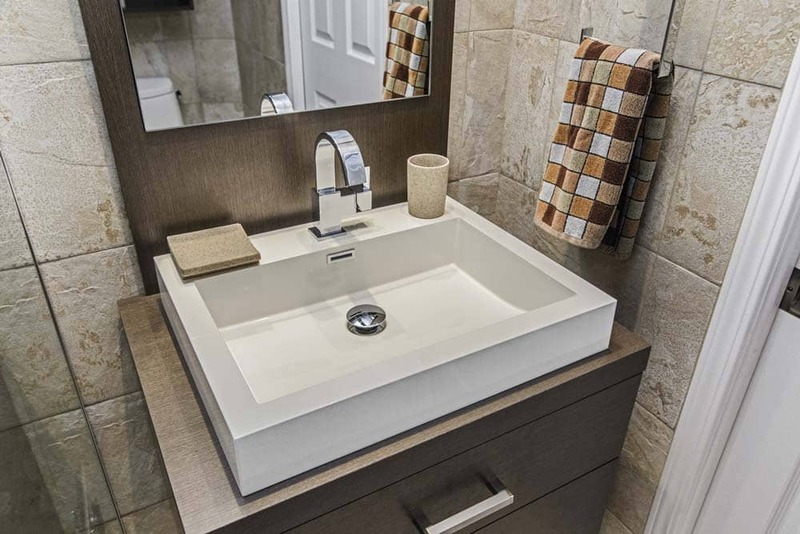 It fits aesthetically in the bathroom and often becomes the center of attention. 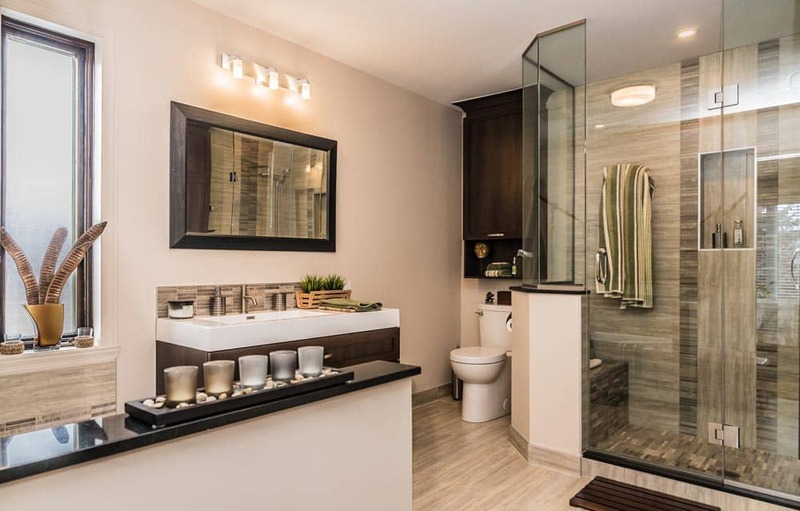 The bathroom now has a totally different look that matches the image of its owner’s desire. At our costumer’s request, this bathroom with an adjacent laundry room has been designed to maximize the natural lighting. The windows have been enlarged and the choice of materials in white accentuates this effect of brightness. An excess of white can make a room feel cold and impersonal. 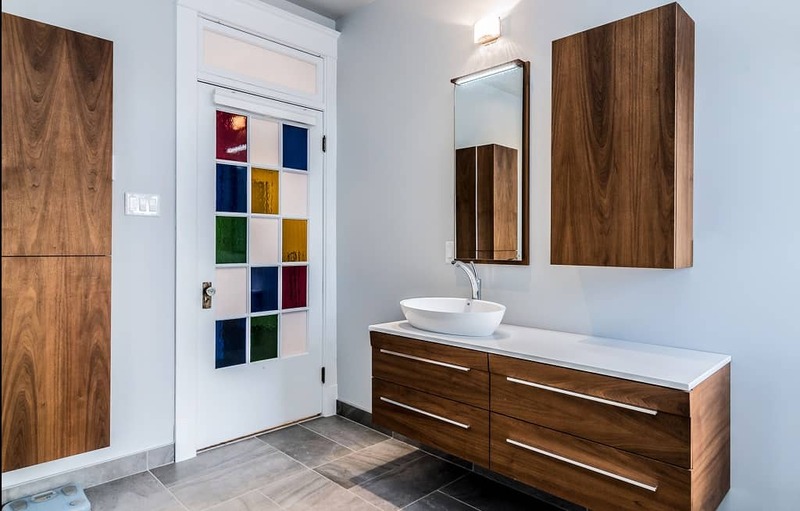 We have proposed, for this bathroom renovation project, to combine the white with a wooden cabinetterie for its warmth and personality. The vertical central cabinet and the horizontal wooden counter create a dynamic volume that completes each other while being very practical. As a design and construction team, we are very satisfied with this simple, chic and contemporary result. Beauty is often in simplicity. 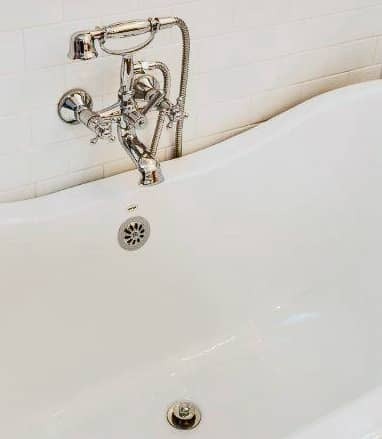 This refined and truly unique bathroom remains greatly functional. 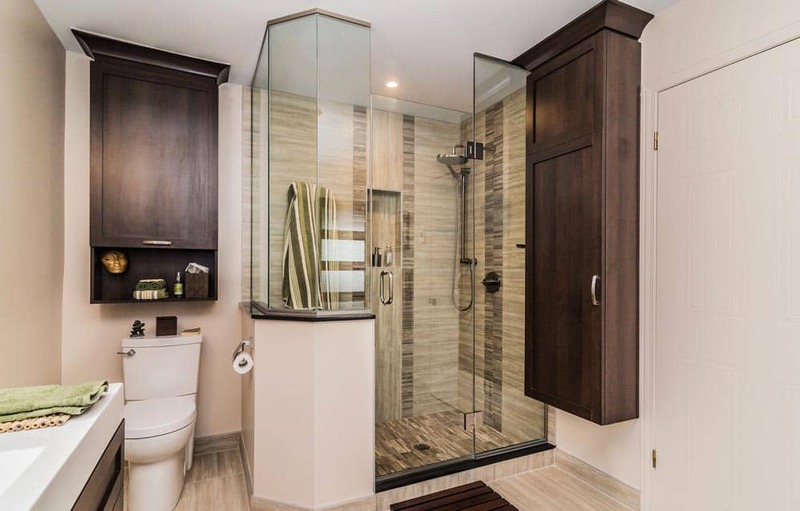 The walk-in shower is an interesting concept that applies well in small spaces and allows access to the shower without obstacles or even a threshold. 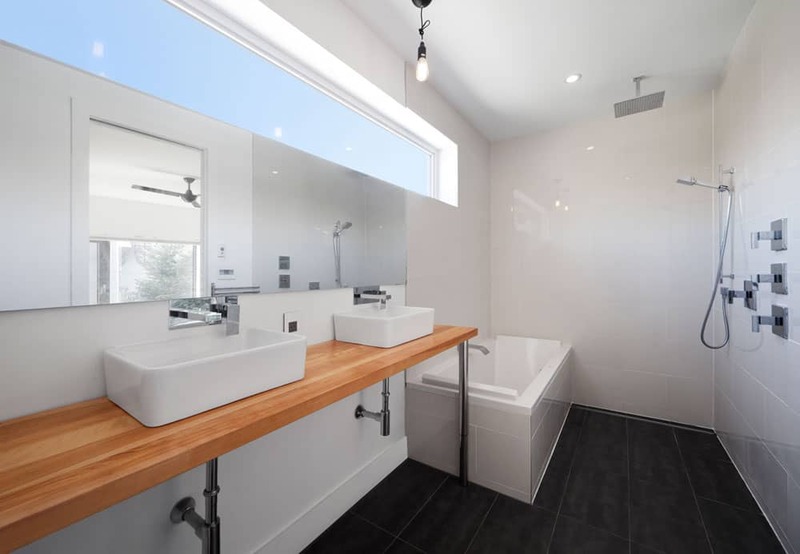 The design of this bathroom is very simple. 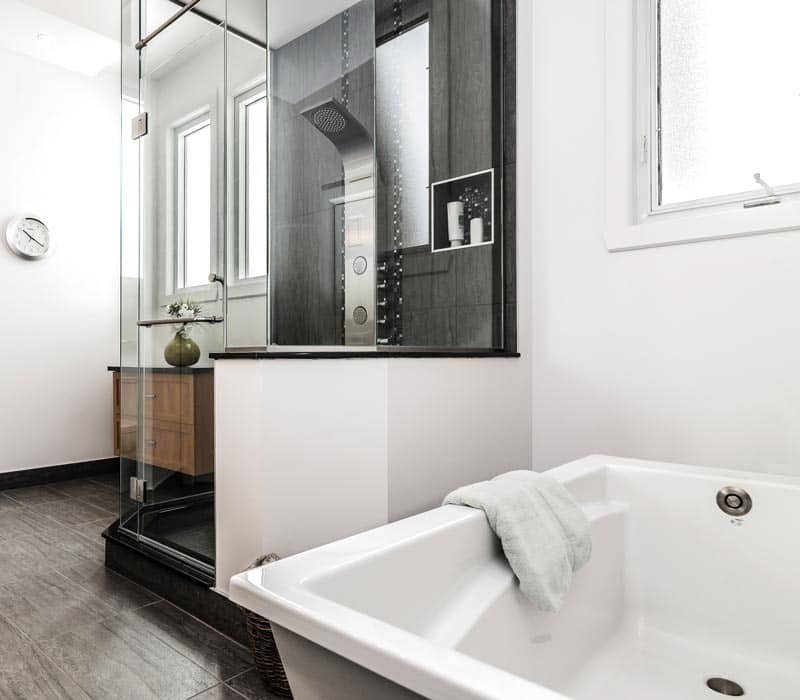 It is a bare bathroom, without any curtains or excessive accessories. The horizontal fenestration brings a great brightness while protecting the intimacy of the occupants. The linear wooden counter adds a warm touch to this zen concept. The horizontal mirror also visually enlarges the space and increasing the brightness of the area. We carried out this work as part of a more complete renovation project including an extension where the bathroom was located. 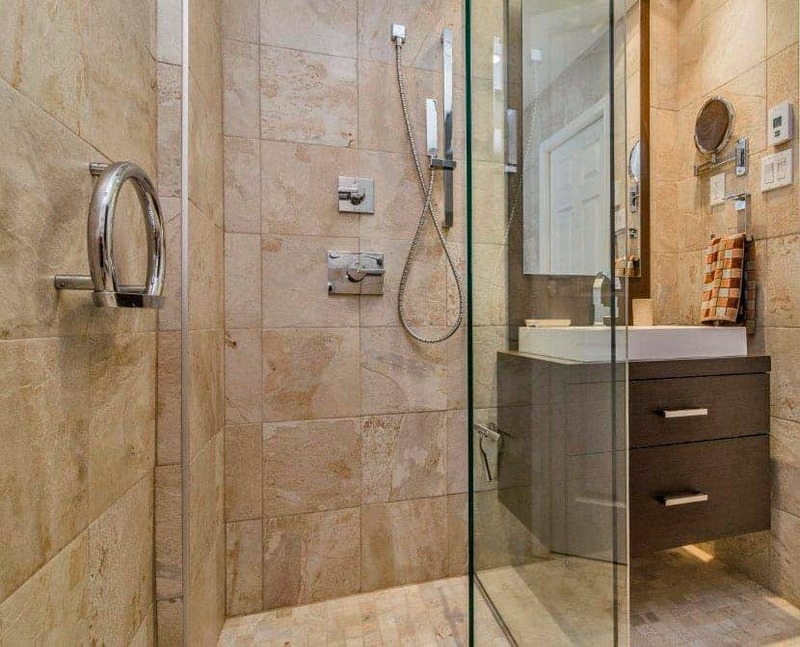 With the popularity of glass showers on the market, it is increasingly difficult to create a “WOW” effect in a bathroom. The owners asked us to renovate the two bathrooms of this cottage. They wanted a complete analysis of their needs, design and of the realization. They were looking for a bathroom concept that was both modern and warm. A good collaboration between our design and estimation teams made it possible to achieve everything while respecting the fixed budget. We have reinvented the typical 50s bathroom to respect the original character of this duplex while meeting the needs of our customers. 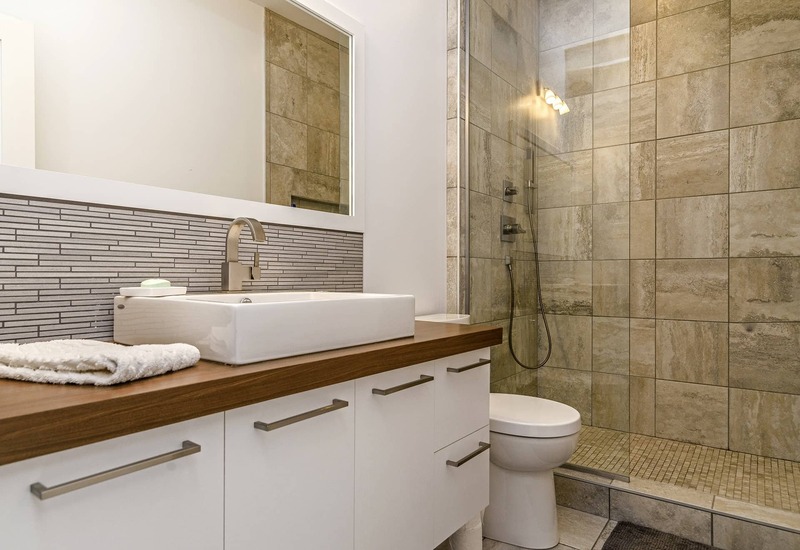 Montreal 1940s to 1970s bathrooms were typically 5 feet by 7 feet. The floors were covered with mosaic ceramics and the walls of pale white, pink, yellow or blue horizontal ceramic tile with a black border. 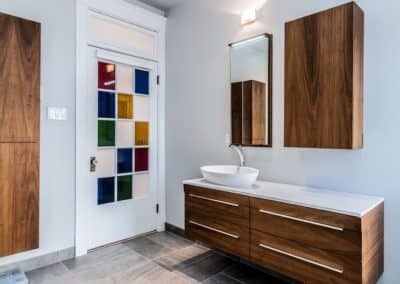 In this bathroom renovation project, we have recreated this unique character while adding a ceramic shower, wall-mounted sinks as at the time, and a horizontal niche serving as shelf. Our team has demonstrated that it is possible to evoke an architectural style without denaturing it while meeting the requirements of today. 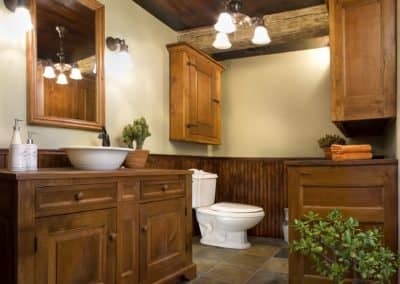 A successful bathroom renovation! The 80s podium baths took up a lot of space and their access was very inconvenient for cleaning it up or washing children. The owners of this house did not use it for many years. 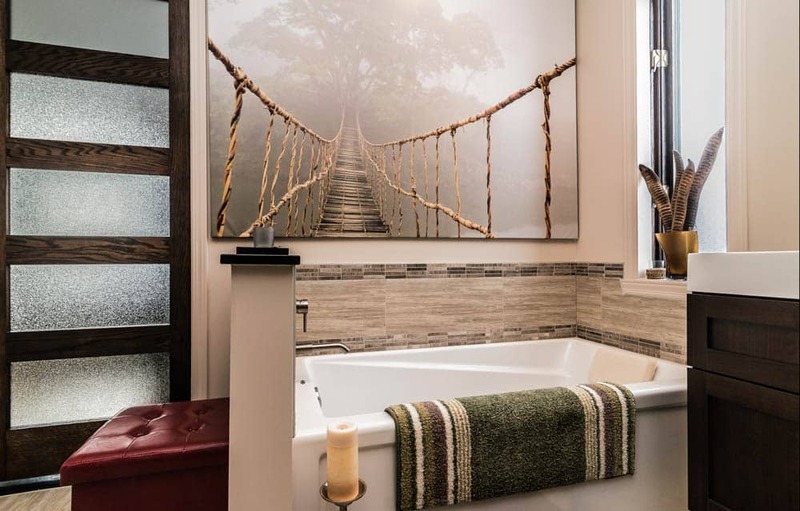 Instead, they dreamed of a pretty shower and an easily accessible bathtub. By removing the podium bath we were able to clear enough space for a spacious shower and a bathtub that was both pretty, practical and comfortable. 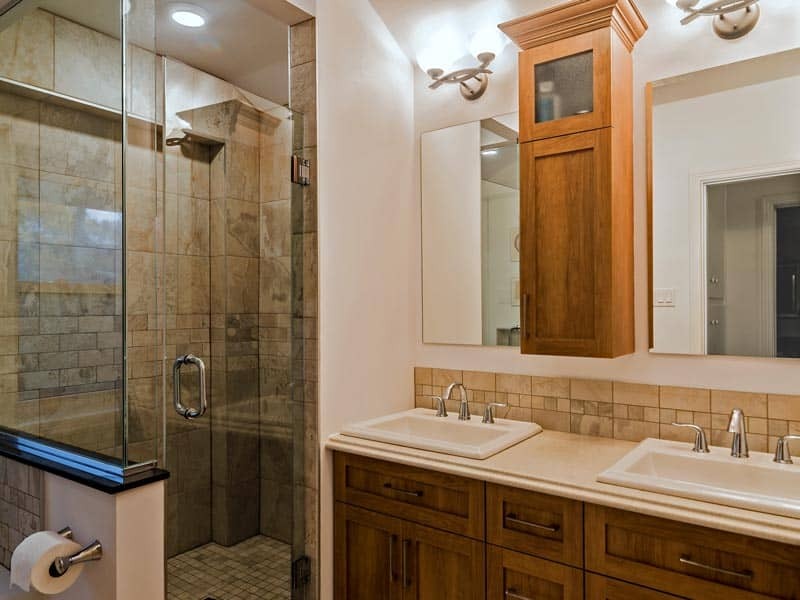 Our designer knows all types of bathrooms with their advantages and disadvantages. We are here to guide you and to help you make a good investment in your work. 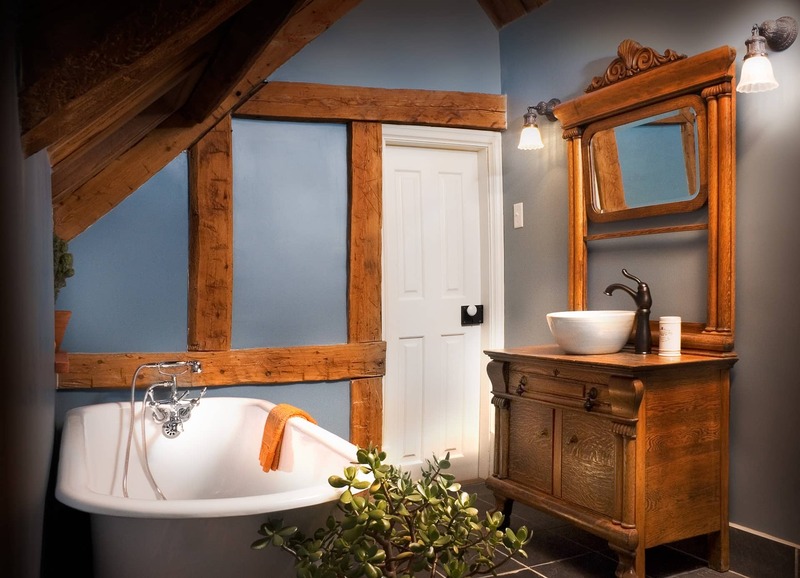 The owners of this historic 1754’s house, wanted to repair the bathroom upstairs. This one had already been renovated with bad materials and an inappropriate configuration. A bathroom renovation was needed … again! The vast majority of the materials used in this project were existing materials that have been restored. The research and restoration work was important, but the result is in line with our expectations and those of our clients. The result was very rewarding for both our design team and our workers. For us, it is important to be proud of the quality of our work. In renovation, there is what we want, what we can and what we have. 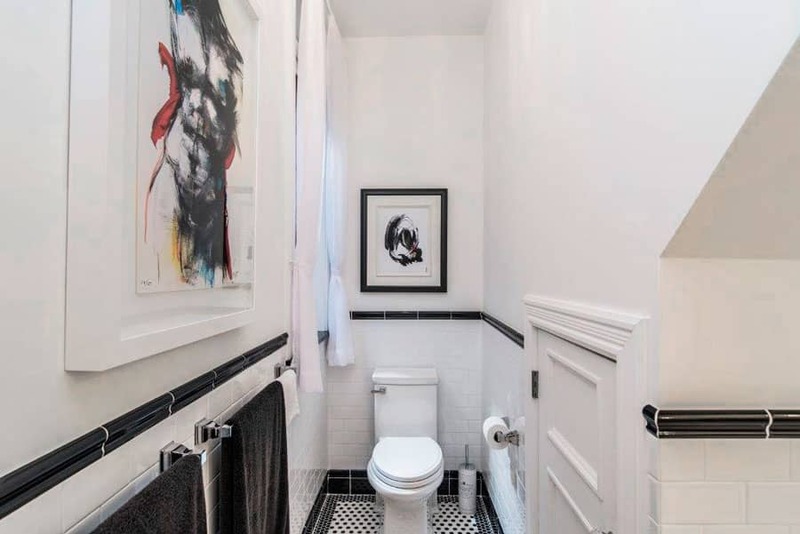 The owners of this house had a small bathroom with an acrylic shower and no possibility of enlargement. We managed to give a little more class to this bathroom that needed it. 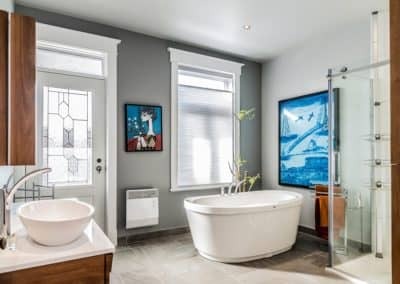 This bathroom being adjacent to the master bedroom we propose to give it a little more character despite its small size. We replaced the acrylic shower with a ceramic and glass shower. To visually increase the floor space, we suspended the vanity. The transparency of the shower and the hanging vanity reduces the confining effect of small spaces. We do not work miracles, but we always try to give you an optimal solution according to your needs and your budget. 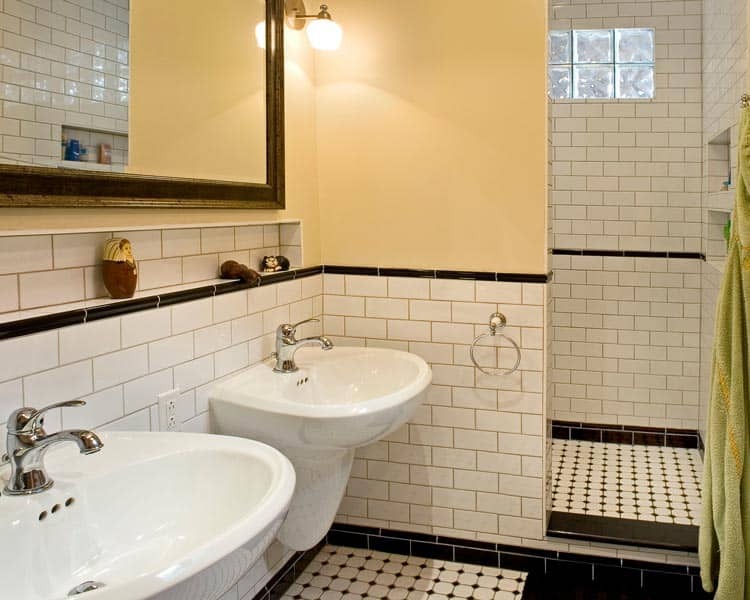 The possibilities of transforming existing bathrooms are often dictated by their current walls and adjacent rooms. 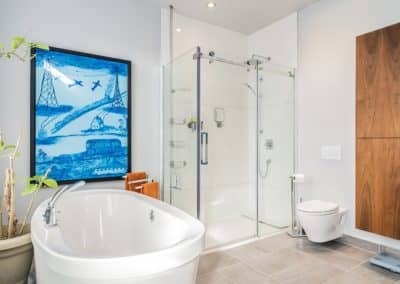 Despite these constraints, the appearance of a standard bathroom can be completely transformed by maintaining a simple and effective design. In this residence, we had to renovate two bathrooms. We kept the standard linear layout by finishing the bathroom with a ceramic shower with a fixed tempered glass panel. This arrangement avoids any shower curtain. A large horizontal mirror gives the impression of enlarging this restricted space. 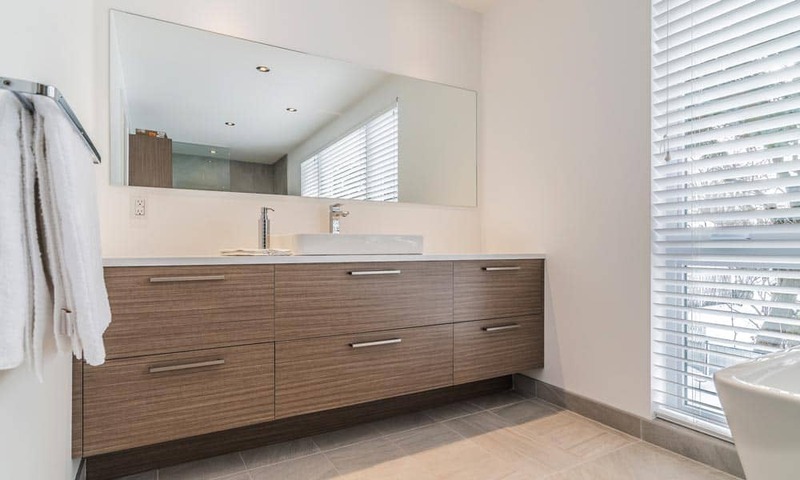 This bathroom is both simple and effective, showing that it is possible to obtain a luxurious appearance with a limited budget. 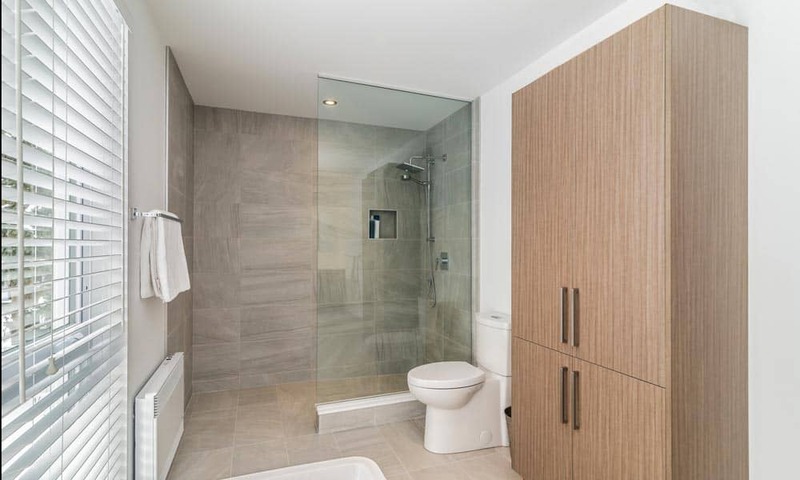 Upon the purchase of their condominium, the new owners of this condo knew that they had to redo the bathroom and that it would be a problem. Indeed, the bottom of a staircase passed in the center of this small room, giving it an “L” shape. They called us for a turnkey project. Our designer realized that we had to take advantage of the staircase to give this room a character of yesteryear. We turned the “problem” into “opportunity”. It must be said that this architectural style was perfectly suited to the rest of this residence. The design of a room must take into account the entire housing so that it is well integrated. It is advantageous for the owners to consult us as soon as they purchase their property for us to guide them in the logical steps of renovation.